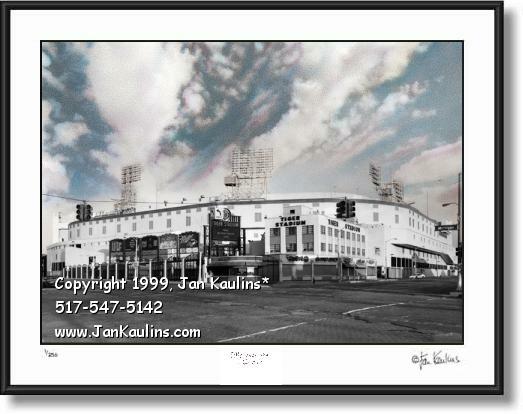 TIGER STADIUM DETROIT 1912 - 1999 PICTURE PHOTO PRINT PHOTOGRAPH ART PHOTOGRAPHY for sale. Old Detroit Tiger Stadium Detroit Michigan black and white hand-colored photo picture print for sale. Old Detroit Tiger Stadium picture photo art print PHOTOGRAPHY FOR SALE . Original DETROIT TIGER STADIUM PHOTO art photography picture PHOTO print for sale. Detroit Tiger Stadium Photo Gallery Art Prints for sale. Detroit Tiger Stadium photo poster pictures prints photographs for sale: This old Detroit Tiger Stadium photo is a picture of a HAND-COLORED black and white Detroit Tiger Stadium photograph which was taken during the final season of play at old historic City of Detroit Tiger Stadium at Michigan and Trumbull in 1999. This historic old Detroit Tiger Stadium picture photo is a picture of billowing summer clouds with a reticulated sky above old Detroit Tiger Stadium at 'the corner' of Michigan and Trumbull in downtown Detroit, Michigan. Reticulation is a very unique film negative processing technique where the temperature is radically changed in the film developer causing a mosaic-like pattern to form on the film and hence creating a beautiful 'texture' in the sky on the print. This Detroit photography picture photograph is one of my personal favorite old Detroit Tiger Stadium photo picture prints. This old Tiger Stadium picture photograph was done as a tribute to the 1999 final season of major league baseball being played at this Detroit historic landmark of old Detroit Tiger Stadium. This vintage historic Detroit Tiger Stadium picture photo print will always be a visual reminder of many happy days spent at the old ballpark, Detroit Tiger Stadium.